The Volkswagen Touran was the German firm's response to the growing compact MPV segment headed by the Opel Zafira. The Volkswagen Touran was the German firm's response to the growing compact MPV segment headed by the Opel Zafira. Like it, the Touran is based on hatchback mechanicals, it being basically a Golf with a more sensible, space efficient body on top. Seven- and five-seat versions were offered, the first generation Touran being introduced in 2003 and running to 2010, where it was replaced by a similarly conservative offering based on the newer Golf underpinnings. In the growing compact MPV marketplace Volkswagen took a fairly conservative approach with the Touran both in styling and in engineering. Based on the solid Golf platform and using much the same engines and transmissions the Touran is unambiguous in its practical role in the Volkswagen line-up, with relatively dowdy, boxy lines signifying this. Those boxy proportions do mean it offers decent interior space for five, with a pair of additional seats in the rear (these were not fitted to all, as some sold as five-seaters) adding pews for your growing family. Inside it lacks the sort of folding-seat versatility of the best in its class, the rear pair in the boot not folding entirely flat out of the way as they do in the Opel Zafira for example. Likewise the cabin is short on useful cubby stowage space compared to rivals like Renault's Scenic. Still, it all feels typically solid and reassuringly simple in its operation in a way that's common to all Volkswagens. 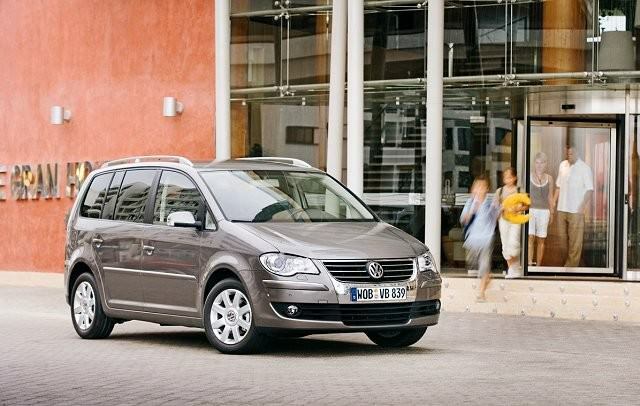 Use the rear seats and there's not much space left in the boot, so the Touran is best considered a useful, spacious five-seater with occasional seating for seven if needed. If you do plan on carrying around six other people inside you'll want one of the bigger petrol engines, or the stronger torque offered by the diesels. Given it was on sale for over seven years the outputs of these changed. The Touran also got a styling facelift in 2006 with a smarter chrome grille surround and new front and rear lights - though the basic engine options remained the same. The choice was 1.6 and 1.4 TSI and 2.0 petrol engines, plus a pair of diesels of 1.9- and 2.0-litre capacity with power ranging from 105- to 170hp. A manual six-speed transmission is standard on all, though the Touran was optionally available with Volkswagen's ‘DSG' automatic with both petrol and diesel engines. A standard six-speed automatic was fitted to earlier cars. Trims follow the usual Volkswagen S, SE, Trendline, Comfortline and Sport depending on year, with Sport models featuring stiffer suspension. The 1.9 TDI engine with a manual transmission in any specification other than Sport is the best buy - the firmer suspension brings little additional sharpness to the drive, but upsets the ride comfort. A conservative offering from Volkswagen in the compact MPV sector, but then family transport is rarely anything but. Not as clever inside as its competition, but a fine, easy drive; decent space and strong brand image count in its favour.